A dry nose is uncomfortable, but treating this symptom does more than make you feel better. A valuable part of the respiratory system, your nasal passages filter, warm and moisturize air before it enters your lungs, and the mucus and cilia, or nasal hairs, protect your lungs by trapping foreign matter and infection-causing organisms. Treating a dry nose is important for your health, and there are several steps that can help you manage this bothersome symptom. Use over-the-counter (OTC) saline or salt-water sprays to moisturize your dry nose. These are safe to use liberally when your nose is dry, and may also be helpful when traveling in airplanes or to dry environments. 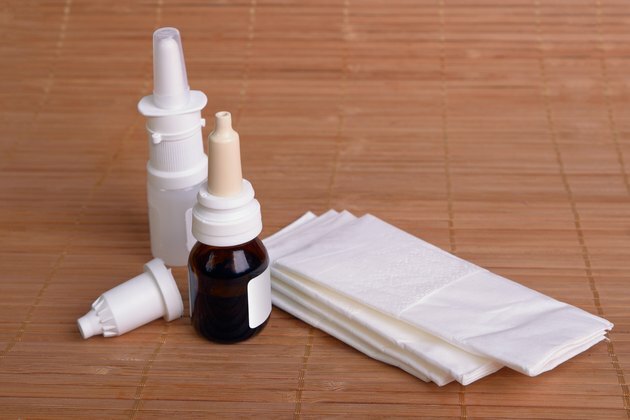 Unless specifically recommended by your doctor, avoid the use of OTC decongestants sprays, as long-term use of these can damage your nasal cilia and make congestion worse. Drink plenty of water or other fluids to correct or avoid dehydration, and to ensure your nose maintains enough mucus. Because mucus lines and moistens your nasal passages and helps to trap airborne material such as dirt, bacteria and other debris, having enough mucus is an important part of your immune system. Place a humidifier in your home and office to add moisture to the air you breathe. Be sure to follow the manufacturer's direction for cleaning the unit, in order to prevent bacteria growth. Also, the U.S. Environmental Protection Agency recommends only using distilled or filtered water in home humidifying units -- particularly the cool-mist ones -- as these types of humidifiers can release minerals and bacteria into the room air. Apply a small amount of moisturizing cream at the opening inside your nose. Rub the moisturizer into the skin to prevent inhalation of the product. Stay away from petroleum-based moisturizers, which could cause pneumonia if accidentally inhaled into the lungs. Instead use a water-based moisturizer or ask your doctor for advice on the use of a nasal moisturizing ointment. Talk to your doctor if you suspect one of your medications may be causing dry nasal passages. An example of medications that can cause this symptom include some anti-anxiety medications, diuretic blood pressure medications, pain relievers, eye drops and heart medications. Do not stop taking or adjust the dose of a prescription medication without first consulting with your doctor. See a doctor if nasal dryness is not relieved within one week of home treatment, or if this symptom is accompanied by dry eyes and dry mouth. While most often the cause of a dry nose is environmental changes or medication side effects, uncommonly it is a symptom of a more serious disorder. European Archives Otorhinolaryngology: Rhinitis Sicca, Dry Nose and Atrophic Rhinitis: A Review of the Literature.